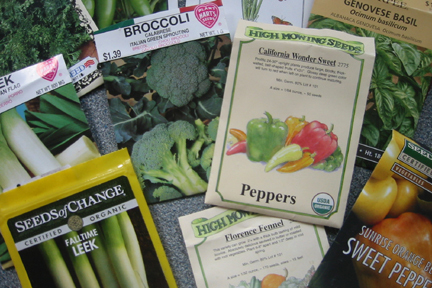 Starting your own seeds will save you lots of money! We had a very nice turnout for our first meeting of 2010. It was great to see some new faces and also wonderful to connect with some old friends. We are ALL looking forward to getting into the garden as soon as possible! It’s too early to start planting, but not too early to start seeds. We were very happy to have Steve Abbott come and run us through the basics of starting your seeds. Steve is an experienced gardener and former farmer who ran his own CSA a few years ago. Steve’s wealth of knowledge and thrifty hints informed us while his dry sense of humor kept us entertained. Thanks Steve! Step 1: Steve starts with a basic bag of seed starting mix from Blue Seal. He gave us the recipe for making your own mix but warned us that you need to sterilize the mix in the oven and it smells bad…very, very bad. BAD! Fair warning people! Step 2: Put your soil in a clean container. Anything will do but ideally 2″-3″ deep with drainage. Wet the soil down and let the moisture soak in overnight. If you are pressed for time, you can wet the soil down with boiling water and wait a couple of hours before planting. Sometimes the boiling water will melt a plastic container, so be careful. Step 3: Plant your seeds according to the packet. The general rule of thumb is cover seeds with soil to a depth of three times their diameter. Step 4: Place container in warm place and keep moist. Do not cover tightly with plastic because that can promote fungus growth. A loose fitting plastic lid is fine. Step 5: Once the seeds start to sprout, put into the light immediately and take off the plastic covers. Keep seedlings moist by using a spray bottle to wet them down. Step 6: Once the seedlings have two or three true leaves, fertilize. Steve, like many organic gardeners, loves Neptune’s Harvest. The instructions for dilution are on the container. Step 7: Thinning. You do not want the seedling’s leaves to be touching each other. Once the seedlings get larger, thin them by cutting out smaller seedlings with scissors. Do not yank out unwanted seedlings because they may disturb the roots of the plants you want to save. Step 8: When the seedlings begin to outgrow their small containers, repot into larger containers. Step 9: When it comes close to the time you want to plant your seedlings in the garden, you need to harden them off so they don’t die. Set your seedlings outside everyday. Start with a half hour in a protected location and build up time over a few days until they can stay outside full time. Step 10: Plant!! Generally, planting is done between May 15 and June 1st in this area. Keep an eye on the weather because our last frost in 2009 was June 3rd. You might need to cover your seedlings if you plant early. Steve told us a story about a neighbor who always waited until the end of June to plant and by August, their gardens always looked the same. As long as your seedlings look healthy don’t sweat the dates for planting too much. Relax! Steve recommended these books. Order them from your local bookstore!